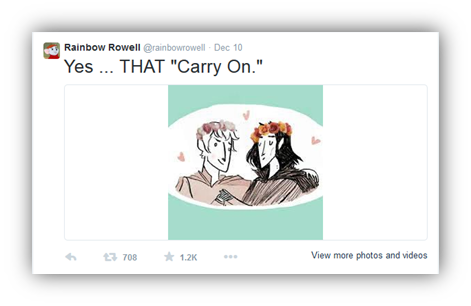 Rainbow Rowell has announced that she will be releasing a spin-off to her Best Selling Novel Fangirl, titled Carry On. For all of you who wanted to read more of Simon and Bas after you had finished Fangirl, well, your wish has just come true. 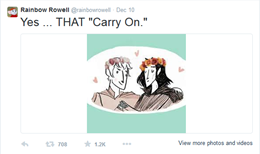 For Rainbow Rowell fans, October 2015 can't come quick enough, and the anticipation for her new spin-off novel, Carry On, has excited her readers everywhere, with them all wanting to get their hands on their very own copy of Cath's beloved fan-fiction. Another stellar book from Rowell. The characters are wonderful, the story was so much fun. I was a little worried it would be a bit too cliche or on the nose, but she took the basic story and turned it into something amazing. I couldn't put it down, and I'll be re-reading it again soon.